To stamp out the hidden costs of stamping lubrication, first keep everything consistent. Second, apply it right. Third, don’t forget disposal. And fourth, get lubricant to the press efficiently. Stampers continually look for ways to control cost and boost productivity. While many analyze equipment costs, tooling, and processing methods to improve operations, most overlook proper lubrication as a way to lower costs, improve quality, and achieve greater throughput. Various industry drivers have brought lubrication to the forefront, cost control being the most prominent. But many companies don’t fully understand their total cost of lubricant use. Most track cost per gallon and fees for lubricant waste removal, but beyond this, hidden costs abound. In essence, you need to use just the right amount of lubricant, mixed to the right dilution ratio for the job, and apply it in the right place and at the right time during the press cycle. It’s a balancing act, to be sure, but knowing where to look for these hidden costs will make this balancing act much easier. The volume of lubricant disposal relates directly to the amount of lubricant used or recycled. Companies often follow a “more is better” approach by using a richer lubricant mix than necessary. Every time you reduce lubricant usage—by using just the right amount for the job and reusing it when possible—disposal costs go down as well. Also consider safety and environmental impacts. You need to control lube application so that workers don’t breathe in mist from overspray. And with ISO 14000 environmental mandates, your company may be required to use less lubricant, which in turn generates less waste that needs to be hauled away. So when the application allows, consider using water-diluted lubricants that can be readily disposed of. Figure 1: Mixing equipment should be able to make proportional changes to the mixture as required by varying manufacturing processes, while ensuring a consistent dilution ratio of lubricant to water. 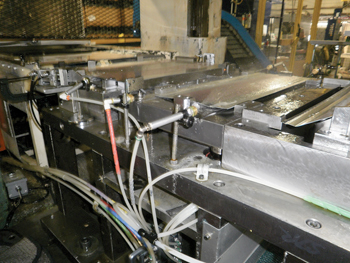 Good lubrication practices make metal forming equipment run smoothly, steadily, and predictably. 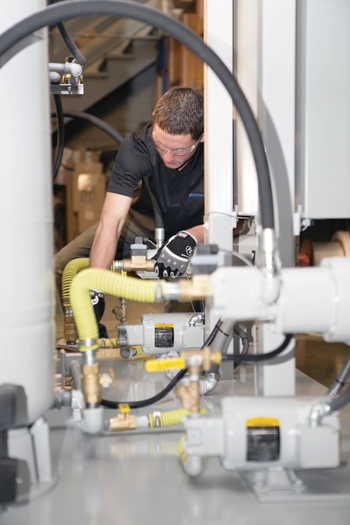 Poor lubrication management can cause erratic, unpredictable output and more downtime. If you manage lubricant improperly, you will need to clean the applicators, reposition sprayers, and make other machine adjustments much more frequently. The most important rule in lubrication management is consistency, starting with accurate and thorough mixing of the lubricant/water solution. Typically, you mix the lubricant with the water to the desired ratio at a location central to the presses. When you analyze the lube mixtures through a process called refracting—a measure of the solid content to see if it’s mixed properly—you may well find that the mixture is, first, too rich and, second, inconsistent from batch to batch. Be sure you mix your lubricant with water to the dilution ratio required for the application. Inaccuracy here leads to excessive lubricant concentrate in the mixture, which adds significant cost. Consider a lubricant mixture of 3 parts water to 1 part lubricant concentrate. What if you consistently reduce the water content by 12.5 percent of the total volume? The resulting increase in lubricant concentrate consumption would go up by 33 percent. This translates into an actual cost of $13.33 per gallon for lube concentrate that should cost only $10 per gal.—plus the additional handling charges. If you err on the other side and add too much water to the mixture, the result can be poor part quality, shorter tool life, and low productivity. Proper use of water-soluble lubricants requires a consistent, homogeneous mixture to perform as intended. Improperly prepared mixtures can separate before and during use, causing application equipment to operate inefficiently, which not only wastes lubricant, but also leads to product quality problems as well as productivity and tool life issues. Hand mixing remains very common, as is the use of premixed lube from the supplier. If you order premixed lubricant, though, know that it too comes with hidden costs. If you buy a 300-gal. drum of a 50:50 lube-to-water mixture, then you essentially are paying to ship 150 gal. of water, which could otherwise be mixed on-site at your facility. Be sure to accurately meter, systematically combine, and thoroughly mix the lubricant and water before dispensing it into a transfer device. Your mixing equipment should be able to make proportional changes to the mixture as required by varying manufacturing processes (see Figure 1). Another factor here is consistent application. So many companies use more lubricant than necessary; puddles of lube on the dies, at the bottom of the press, and on the floor are classic telltale signs of overapplication. The goal is to put the lubricant on the part being stamped, not everywhere else (see Figure 2). You also may find that lubricant is being applied differently, depending on the shift. Each shift often has its own preferred method for applying lubrication to the sheet metal. Workers on each shift may move applicators and adjust volume or timing. The result can be quality variation and production delays. Figure 2: Like any other lubricant application device, sprayers integrated into the die should apply lubricant at the right consistency and at the right place and time during the press cycle. Various equipment can make it less arduous to maintain proper lubricant consistency, both in its dilution and method of application. Which to use depends, as always, on the stamping job. Like anything else, though, using the wrong kind of equipment for the job at hand can seriously drain cash, especially over the long term. A variety of lubricant applicators are available, including drip buckets, rollers, airless spraying systems, and electronic airless spraying systems. Although effective, roll coaters can be expensive to install and maintain. They also can take up significant space, and can limit lubricant application to one point only. If you are using mechanical piston-actuated sprayers, note that if lubricant volume required exceeds the capacity of the pump, then the pump must be double- or triple-stroked to obtain the required volume. Because all pumps run in unison, they all must run at this higher rate, wasting lubricant. Electronic airless sprayers perform very well but rely upon pre-pressurized lubricant regulated to a precise pressure within a manifold assembly. Each manifold assembly includes a network of independently controlled injector valves that meter the volume of lubricant applied at a precise press interval. This provides independent programming of each application nozzle with regard to volume and stroke counts, the ability to apply the lubricant at various press positions, and the virtual elimination of any lubrication-related downtime. Still, no matter how efficient the lubrication method, you still will have problems if someone sets up lubrication nozzles incorrectly by, say, mixing up spray nozzle tube connections. This causes scrap, unplanned downtime, and serious costs. Training, proper work instructions, and documentation help here, but special lubricant manifolds can help engineer out the problem (see Figure 3). 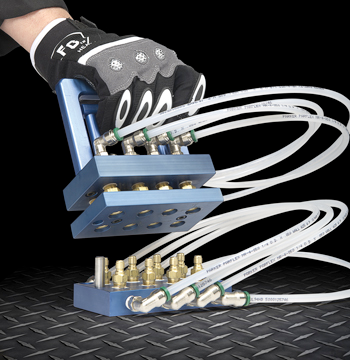 Designed for spray nozzle systems, these die-mounted quick-connect manifolds simplify changeover. All nozzles mount permanently to the die. During die changeover, you unclick the quick-disconnect manifold and remove the die. The new die is positioned, and the new manifold plugged in. You then load the part program and spray profile. This spray profile essentially instructs the system to apply the right amount of lubricant at the right place on the workpiece, at the right time during the press cycle. Figure 3: Die-mounted, quick-connect systems help simplify changeover. Once mixed, lubricant has to be carried to the presses, which is sometimes still accomplished by hauling a 5-gal. bucket across the shop floor, or by positioning a 55-gal. drum or 300-gal. tote near the press. If your shop runs three shifts, and each requires four 5-gal. buckets of lubricant, the labor-hours spent mixing and carting lubricant can add up quickly. To reduce these labor-hours and avoid variations in mixtures and application, more stampers are moving toward plantwide closed-loop systems that provide consistent control over the lubrication application process. Lubricants are mixed at a central location and distributed via an in-plant piping network connected to each press. This provides consistent and ample lubricant as needed at each machine. It also effectively eliminates labor requirements as well as lubrication costs, because the system maintains the appropriate lubricant dilution as required for the job and delivers the appropriate amount, no more and no less. This in turn produces less lubricant waste to haul away. Certain systems can supply up to two to three different mixtures of lubricant concentrations to each press for various material applications. Some also have monitoring systems for automatic mixing and dispensing, along with built-in diagnostic capability. Although a closed-loop system can function with just the mixer and applicator, you can also consider a reclamation system. For instance, some units use coalescing plate separators to separate oil from coolant or water. By cleverly utilizing the buoyancy of oil droplets, the technology purifies the stamping fluid, which in turn can reduce cooling or lubricating requirements necessary for the application. Best practices in stamping lubrication boil down to monitoring and managing the variables. Whenever possible, “right-size” lubricant usage—applying no more and no less than needed. And depending on the job, you also may be able to recycle more of your lubricant, effectively reducing overall usage. Maintain the right lubricant dilution, use the right amount of lubricant for the job, and apply it when and where needed. If you consider all this, you can effectively stamp out hidden costs of press lubrication.